Looking for a 2019 Subaru Crosstrek in Lachine? Rather try the new 2019 Mazda CX-3 at your Spinelli Mazda dealership! Being practical, economical and dynamic, sub-compact SUVs are becoming ever more popular year after year. And even if they are particularly well adapted to the urban environment, neither do the highway and the forest roads discourage them. This is the case for the brand-new 2019 Mazda CX-3 that you will find at Spinelli, your Mazda dealership near St-Laurent and the West Island! Give it a try now and you'll find it has nothing to envy the competition for, including the 2019 Subaru Crosstrek! Adapting to all roads with its i-ACTIV 4-Wheel Drive, which offers outstanding manœuvrability on both winding and ice-or snow-covered roads. In fact, this system monitors driving conditions 200 times per second: from the steering angle to using the windshield wipers, from braking habits and the outside temperature, everything is used to predict the necessary traction. Moreover, to the 2.0-litre DOHC SKYACTIV-G 4-cylinder engine, the 2019 CX-3 consumes only 8.6 L/100 km in the city and 7.4 L/100 km on the highway. This is less than the 2019 Crosstrek, whose more gourmet engine displays 10.5 L/100 km in the city and 8.1 L/100 km on the highway. The 2019 CX-3 comes standard with a range of safe driving assistants including Rear Cross Traffic Alert, a Blind Spot Monitoring System, Intelligent City Brake Assist, and Slope Start Assistance. The GS version of the 2019 CX-3 adds the i-ACTIVSENSE package which includes cruise control with radar sensor and stop/start function, intelligent brake assist system, pedestrian detection at the front, front obstruction alert, lane departure warning and distance evaluation assistance system. The 2019 CX-3 GT crowns all these devices by adding the system of recognition of traffic signs. As you can see, the 2019 Mazda CX-3 is covered by Mazda’s unlimited mileage base warranty, which also applies to the powertrain. 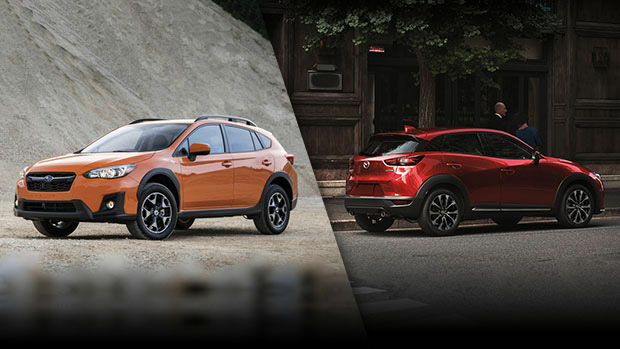 When you visit Spinelli Mazda near the West Island and Laval, you should also inform yourself about the many benefits of Mazda financing and Mazda promotions and enjoy your new acquisition even more!